1 Federal University of São Paulo (Unifesp), São Paulo, SP, Brazil. 2 Federal University of Tocantins (UFT), Palmas, TO, Brazil. Background: Brain-imaging studies in post-traumatic stress disorder (PTSD) have consistently revealed alterations in brain structure and function and this is correlated to symptomatology. However, few studies have investigated the role of biomarkers in PTSD some specific groups, as police officers. Objective: To evaluate prefrontal and limbic volumes, and cortical thickness of police officers exposed to trauma during work who developed post-traumatic stress disorder, resilient matched controls (without PTSD), and compared to healthy civilians. Methods: Prefrontal and limbic volumes, and cortical thickness of 12 police officers with PTSD, 12 resilient police officers, and 12 healthy civilians who underwent brain MRI were analyzed. Results: Differences in limbic structures volume were not significative after Bonferroni correction. 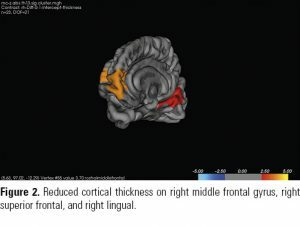 A significant reduction in cortical thickness on right rostral cingulate, right and left middle frontal gyrus, left superior frontal, left lingual, calcarine and cuneus were observed in PTSD group in comparison to controls was observed. Discussion: Although preliminary, our results suggested not only the association between cortical thickness and PTSD, but also indicated that patients and controls have anatomical differences. Keywords: Post-traumatic stress disorder, cortical thickness, limbic system, police officers, trauma. Post-traumatic stress disorder (PTSD) is a psychiatric condition experienced by individuals after suffering psychological trauma. PTSD symptoms include avoidance of trauma-related stimuli, emotional numbing, re-experiencing the traumatic event, hyperarousal, and cognitive deficits1-3. 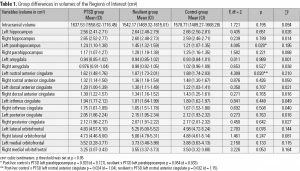 Data from a large sample that the lifetime prevalence of PTSD in general population is approximately range from 1.3% to 9.2%4, worldwide, and 11.1% to 14.7% in Brazil5, with symptoms being triggered by many different types of events4,5. Brain-imaging studies in PTSD have consistently revealed alterations in brain structure and function and this is correlated to the PTSD symptomatology6. The most replicated findings are reduced volume in regions of the limbic system, such as amygdala7,8, hippocampus9, and anterior cingulate cortex (ACC)1. Other studies have found a thinner cortex in frontal and temporal areas10,11, and in a longitudinal assessment conducted in a recovered group of PTSD showed a greater dorsolateral prefrontal cortex associated to improvement in PTSD symptoms12. Studies in adult PTSD have revealed altered function in several different areas of the prefrontal cortex including the dorsolateral prefrontal cortex, the ventrolateral prefrontal cortex, the medial prefrontal cortex, the anterior cingulate cortex, and the orbital frontal cortex compared to controls13,14. The medial prefrontal cortex (mPFC) seems to play a key role in fear extinction of neurocircuitry models in anxiety and PTSD15 Studies in both humans and animals reinforce the involvement and interaction among amygdala, hippocampus and mPFC in fear contextual learning15. The presence of an adverse event is necessary but not sufficient for the development of PTSD. In fact, only one in 10 subjects will develop the disorder16,17, stressing that there are genetic and environmental factors predisposing certain patients to PTSD. The study of biological markers associated with PTSD is an extensive research field with promising results for both basic and clinical knowledge1,17. Brazil has a unique environment to conduct translational research about psychological trauma and posttraumatic stress disorder, since urban violence became a Brazilian phenomenon, being particularly related to the rapid population growth of its cities1,18. The causes of posttraumatic stress disorder are many, including the different types of traumatic events each person can be exposed to. In turn, police officers are a group that is continually exposed to stressful and traumatic factors. At the same time, they are expensive to train and require quick return when they are ill, given their role in population safety. However, few studies have investigated the role of biomarkers in PTSD police officers19,20. Reduced amygdala, thalamus and globus pallidus volumes were observed in police officers with chronic PTSD that had higher re-experiencing scores associated to higher arousal ratings of negative pictures during trauma related paradigm21. Compared with other occupational groups, police officers face an increased and anticipated risk of exposure to life-threatening and potentially traumatic events in their work environments (for example, when intervening in violent situations or witnessing suffering and death of others22). It has been found that the organizational and psychosocial work environment of police officers may affect the degree and strength of PTSD symptoms23. The diagnosis of PTSD is intrinsically linked to the presence of a traumatic event, but the traumatic event per se is not sufficient for the disease development. In fact, only one in ten people will develop PTSD after experiencing trauma indicating that genetic and environmental factors contribute to the onset of PTSD24. In this study we hypothesized that the volumes of the cingulum and amygdala, and thickness of frontal cortex are lower in police officers exposed to traumatic situations who developed PTSD compared to those exposed to the same situation but did not develop PTSD and to healthy civilians. In this context, the goal of the present study was to investigate alterations in limbic structures and frontal cortex police officers exposed to traumatic events during work and compared to resilient military police and healthy civilians. Thirty-six subjects matched by gender (all males) and age (mean age: 35, standard deviation [SD] ± 4 years old) were divided into three groups: 12 police officers exposed to trauma with PTSD, 12 police officers exposed to trauma without PTSD (resilient officers), and 12 civilians without a history of trauma exposure. Police officers with at least 10 years of work experience were recruited from the General Command of the Military Police of Tocantins, Brazil. Healthy civilian subjects (controls) were recruited from the same community. Traumatic experiences considered for the present study were defined as duty-related urban violence, and included the following experiences: being threatened, being shot, being beaten, witnessing a death, witnessing a beating, experiencing a car accident, witnessing the death a friend. Patients were eligible for study participation if they met the following inclusion criteria: 1) DSM-IV criteria for a diagnosis of PTSD25; 2) aged between 18 and 60 years; 3) male gender; and 4) the experience of a traumatic event, as previously defined, during duty. Participant exclusion criteria included the following: 1) a history of bipolar, psychotic, or borderline personality disorder; 2) substance dependence or abuse (excluding nicotine and caffeine); 3) severe or unstable concurrent illness; 4) psychotropic medication use less than four weeks prior to MRI, 5) current suicidal ideation or the presence of psychotic symptoms; 6) use of psychoactive medications such as antidepressants, neuroleptics, anxiolytics or sedative hypnotics and mood stabilizers within the last eight weeks, 7) a Beck Depression Inventory (BDI) score of more than 11 points. Participants were informed about the research procedures and risks of this study, and signed an informed consent form that was fully approved by the Ethical Committee of the Federal University of Tocantins (014/2012). For the diagnosis of mental health disorders according to DSM-IV criteria, we used the Structured Clinical Interview for DSM-IV I26,27. To assess the presence of PTSD in patients, we used the Clinician-Administered PTSD Scale (CAPS)28, a 30-item scale that investigates the frequency and intensity of PTSD symptoms and traumatic life experiences. Scores ranged from 0 to 136, with the following classifications: subclinical, 0 to 19; mild, 20 to 39; moderate, 40 to 59; severe, 60 to 79; and extreme, 80 and above. Symptoms were divided into the following clusters: re-experiencing symptoms, avoidance and numbing symptoms, and hyperarousal symptoms. To assess depressive symptoms in clinical settings, we used the Beck Depression Inventory (BDI)29, a self-administered 21-item questionnaire, which has been validated for the Brazilian population. Scores ranged from 0 to 63, with depression classified according to the following score categories: minimal, between 0 and 11; mild, between 12 and 19; moderate, between 20 and 35; and severe, between 36 and 63. Subjects with scores more than 11 points were excluded. Imaging data were acquired using a Philips 1.5T Sigma scanner. Structural MRI images were acquired using a sagittal T1 acquisition series (TR = 9.8 ms, TE = 3.1 ms, flip angle = 30°, NEX = 1, matrix size = 256 × 256, FOV = 24 cm, thickness = 1.0 mm), yielding 160 slices. Figure 1. Regions analysed in the study. We used an automated, non-biased atlas-based Bayesian segmentation method, applied in Freesurfer v.5.0 (http://surfer.nmr.mgh.harvard.edu/). Too derive quantitative estimates of brain structure and to label cortical and subcortical tissue classes Freesurfer processing for volumetric T1-weighted images included: motion correction, brain extraction and removal of non-brain tissue using a hybrid watershed/surface deformation procedure, automated spatial transformation and white matter (WM) segmentation of subcortical volumetric structures, intensity normalization, tessellation of grey matter GM/WM boundary and automated topology correction and surface deformation, following intensity gradients to place optimally GM/WM and GM/CSF borders at the location where the greatest shift in intensity defines the transition to the other tissue class. Image outputs from each stage of Freesurfer processing were visually inspected. Freesurfer automatically assigns a neuroanatomical place to each location on a cortical surface model based on probabilistic information estimated from a manually labeled training set (made using FreeSurfer). This method incorporates both geometric information derived from the cortical model, and neuroanatomical convention, as finding in the training set. The result is a complete labeling of cortical sulci and gyri. The resulting segmentation and parcellation was inspected by one of the authors and no adjustment or reprocessing was needed. No manual region of interest (ROI) was outlined in this study. To account for inter-individual differences in head size, intracranial and cerebral volumes were corrected by dividing by each subject’s intracranial volume and multiplying this ratio by 1000 (Figure 1). Data were codified and analyzed using the Statistical Package for the Social Sciences (IBM SPSS for Windows, version 15.0). Prior to analyses, measures were examined for normality using the Shapiro-Wilk test. Significance levels were set at p < 0.05, using a two-tailed test. Group differences in volumes were investigated using the general linear model (Multivariate analysis of covariance – MANCOVA). Results were corrected for multiple comparisons using Dunnet’s post-hoc test (p ≤ 0.05), however to improve analysis all values were corrected by Bonferroni method (p ≤ 0.0028). MANOVA effect sizes were calculated using eta partial squared ( 2), and compared between groups using Cohen’s d method (d). The Query Design Estimate Contrast (QDEC) interface of FreeSurfer was used to carry out a general linear model (GLM) analysis at each vertex of the cortical surface. Cortical thickness was considered as the dependent variable; group (patients vs healthy controls), age, and their interaction were explanatory variables, and intracranial volume was a nuisance variable. Results were corrected for multiple comparisons at the cluster level using the Monte Carlo approach for p-cluster < 0.05. PTSD subjects has total mean CAPS score of 64.9 (SD ± 28.5) and mean time to trauma of 2945 days (SD ± 2721). Mean time to trauma for resilient group was 3630 days (SD ± 2654). Figure 2. 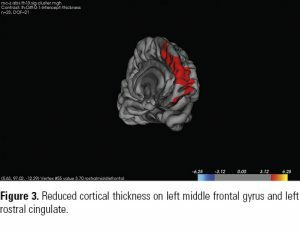 Reduced cortical thickness on right middle frontal gyrus, right superior frontal, and right lingual. Figure 3. Reduced cortical thickness on left middle frontal gyrus and left rostral cingulate. A significant reduction in cortical thickness on left rostral cingulate, left middle frontal gyrus, right middle frontal gyrus, right superior frontal, and right lingual were observed in PTSD group in comparison to controls survived Monte Carlo null-Z correction for multiple comparisons at p < 0.05. No differences between PTSD, healthy controls and resilient controls survived multiple comparison correction (Figures 2 and 3). A significant reduction in cortical thickness on right rostral cingulate, right and left middle frontal gyrus, left superior frontal, left lingual were observed in PTSD group in comparison to controls survived Monte Carlo null-Z correction for multiple comparisons at p < 0.05. No differences between PTSD, healthy controls and resilient controls survived multiple comparison correction (Figures 2 and 3). Not all individuals exposed to traumatic events develop PTSD. Biological measures of PTSD should reflect predictive markers of risk/resilience (pre- or posttrauma exposure), or disease markers indicating diagnostic status or symptom severity. More refined applications include prognostic markers of therapy response that may inform treatment choice or monitor response30. Once the biological correlates of these constructs are identified, such biomarkers may help identify those at highest risk following trauma exposure, target prevention efforts, aid in diagnosis, treatment planning, and recovery assessment for patients, and ultimately inform the development of safe and effective pharmacological treatments for PTSD. In this present study, we investigated possible alterations in brain volume and thickness of police officers with PTSD secondary to traumatic events during duty. Our results showed reduced cortical thickness in prefrontal area of PTSD group when compared to resilient police officers and healthy civilians. Due to the cross-sectional nature of this study we can not state whether the changes were present before or after the disorder. For a while the results suggests involvement of the frontal region in individuals who develop PTSD. On the other hand, the results also demonstrated lack of evidences of alterations in the frontal and limbic volumes in PTSD group compared to resilient police officers and controls. Literature remains contradictory about neurobiological findings in PTSD. Previous studies have found reduced volume and gray matter of hippocampus and amygdala31,32 related to PTSD. We previously observed that enlargement of hippocampus and amygdala was related to early trauma in subjects exposed to urban violence1 which corroborates to the findings of Kuo et al.33 that observed larger amygdala volumes among patients with PTSD with a positive correlation between early trauma and severity of adult trauma exposure. However, no volumetric differences in these structures were found in this study. Despite our results regarding to the volume of brain structures did not reach statistical significance, others studies that investigated ACC volumes in patients with PTSD using MRI have yielded conflicting findings. For instance, one study using the conventional manual tracing method found significant volume reductions in the pregenual, but not dorsal, ACC34. A voxel-based analysis found gray matter volume reductions in the dorsal ACC among patients with PTSD35. Additionally, no differences were found in ACC volume between patients with acute PTSD and healthy subjects; however, structural dissimilarities were reported35. Few studies have assessed cortical thickness in PTSD. 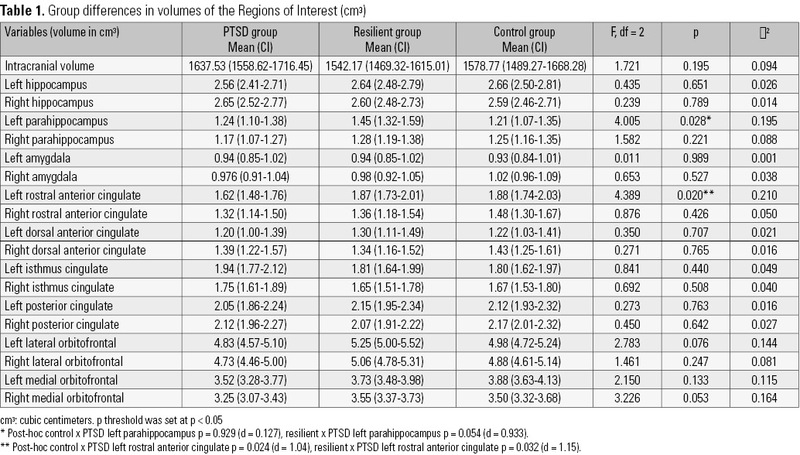 Corbo et al.36 found a positive association between thickness of the left posterior cingulate/paracentral area and PTSD symptoms severity in veterans exposed to early trauma. On the other hand, this association was negative in the veterans without history of trauma in childhood37. Woodward (2009), also investigated the cortical thickness in adult combat-related PTSD and found thinner cortex in participants with PTSD at superior temporal cortex in comparison with healthy controls37. The study of Kuhn reported a reduction of cortical thickness of right medial orbitofrontal cortex negatively associated to trait anxiety in a healthy sample38. It has been suggested that the neurobiology of PTSD involves circuitry pathology, rather than implication of a single brain structure. In patients with PTSD, the default mode network, a set of structures including the medial prefrontal cortex and the posterior cingulate cortex (believed to be more “active” during the resting state) is believed to be affected by the pathology underlying the disorder39. Specifically, the resting-state functional connectivity of the posterior cingulate cortex, perigenual anterior cingulate cortex, and the right amygdala is associated with current PTSD symptoms, whereas functional correlation with the right amygdala is predictive of future PTSD symptoms40. There is also evidence using diffusion tensor imaging that white matter structural integrity in the cingulate bundle is compromised in PTSD patients compared with that of healthy individuals41. Therefore, in addition to functional impairment of the amygdala, mPFC and ACC, functional connectivity may be disrupted in PTSD1. The primary strength of the current study is that the sample was well selected: we used paired groups, including only males, excluded those with alcohol abuse, and recruited subjects from the same site. Secondly few studies have investigated morphometric brain alterations in police officers related PTSD and the result of this study may contribute to the understanding of PTSD in occupations with high stress levels. This study has a few limitations that should be noted: first, the cross-sectional study design precludes determination whether the observed changes are cause or consequence of PTSD; secondly, the sample size in the present study was not sufficiently large to expand multivariate analysis. Our results suggest that police officers with PTSD has reduce cortical thickness in prefrontal area compared to resilient police officers and healthy controls. This finding adds that the prefrontal region may be affected in police exposed to traumatic situations. Since this is an area involved in cognitive functions such impairment may have direct implications on the performance of this profession. Also, the results demonstrated lack of evidences of alterations in the frontal and limbic volumes in PTSD group compared to resilient police officers and controls. However, these results need to be confirmed by studies with larger samples and different methods. Moreover, ours results compared to literature suggested that neuroimaging findings in PTSD is heterogeneous, and multiple factors (including individual factors) are related to this disorders. This study was supported by the State of São Paulo Funding Agency (Fapesp) by the Grant: 2004/15039-0, and the National Research Council (CNPq) by the grant: 476537/2011-8, and by Millenium Institute of Violence and Mental Health by the grant: 420122/2005-2. The Fapesp and CNPq had no further role in the study design; in the collection, analysis and interpretation of the data; in the writing of the report; or in the decision to submit the paper for publication. The manuscript submission was supported by Federal University of São Paulo (Unifesp). There are no contributors to declare. The authors report no financial or other relationship relevant to the subject of this article. 1. Baldaçara L, Zugman A, Araújo C, Cogo-Moreira H, Lacerda AL, Schoedl A, et al. Reduction of anterior cingulate in adults with urban violence- related PTSD. J Affect Disord. 2014;168:13-20. 2. Linares IMP, Corchs FDF, Chagas MHN, Zuardi AW, Martın-Santos R, Crippa JAS. Early interventions for the prevention of PTSD in adults: a systematic literature review. Arch Clin Psychiatry. 2017;44(1):23-9. 3. Osório FL, Silva TDA, Santos RG, Chagas MHN, Chagas NMS, Sanches RF, et al. Posttraumatic Stress Disorder Checklist for DSM-5 (PCL-5): transcultural adaptation of the Brazilian version. Arch Clin Psychiatry. 2017;44(1):10-9. 4. Perrin M, Vandeleur CL, Castelao E, Rothen S, Glaus J, Vollenweider P, et al. Determinants of the development of post-traumatic stress disorder, in the general population. Soc Psychiatry Psychiatr Epidemiol. 2014;49:447-57. 5. Ribeiro WS, Mari Jde J, Quintana MI, Dewey ME, Evans-Lacko S, Vilete LM, et al. The Impact of Epidemic Violence on the Prevalence of Psychiatric Disorders in Sao Paulo and Rio de Janeiro, Brazil. PLoS One. 2013;8(5):1-13. 6. Bremner JD. Neuroimaging studies in post-traumatic stress disorder. Curr Psychiatry Rep. 2002;4(4):254-63. 7. Starcevic A, Postic S, Radojicic Z, Starcevic B, Milovanovic S, Ilankovic A, et al. Volumetric analysis of amygdala, hippocampus, and prefrontal cortex in therapy-naive PTSD participants. Biomed Res Int. 2014;2014:968495. 8. Karl A, Schaefer M, Malta LS, Dorfel D, Rohleder N, Werner A. A meta-analysis of structural brain abnormalities in PTSD. Neurosci Biobehav Rev. 2006;30(7):1004-31. 9. Woon FL, Sood S, Hedges DW. Hippocampal volume deficits associated with exposure to psychological trauma and posttraumatic stress disorder in adults: a meta-analysis. Prog Neuropsychopharmacol Biol Psychiatry. 2010;34(7):1181-8. 10. Geuze E, Westenberg HG, Heinecke A, de Kloet CS, Goebel R, Vermetten E. Thinner prefrontal cortex in veterans with posttraumatic stress disorder. Neuroimage. 2008;41(3):675-81. 11. Bing X, Ming-Guo Q, Ye Z, Jing-Na Z, Min L, Han C, et al. Alterations in the cortical thickness and the amplitude of low-frequency fluctuation in patients with post-traumatic stress disorder. Brain Res. 2013;1490:225-32. 12. Lyoo IK, Kim JE, Yoon SJ, Hwang J, Bae S, Kim DJ. The neurobiological role of the dorsolateral prefrontal cortex in recovery from trauma. 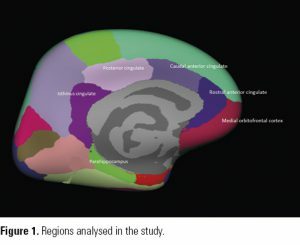 Longitudinal brain imaging study among survivors of the South Korean subway disaster. Arch Gen Psychiatry. 2011;68(7):701-13. 13. Shin LM, Wright CI, Cannistraro PA, Wedig MM, McMullin K, Martis B, et al. A functional magnetic resonance imaging study of amygdala and medial prefrontal cortex responses to overtly presented fearful faces in posttraumatic stress disorder. Arch Gen Psychiatry. 2005;62(3):273-81. 14. Ke J, Zhang L, Qi R, Li W, Hou C, Zhong Y, et al. A longitudinal fMRI investigation in acute post-traumatic stress disorder (PTSD). Acta Radiol. 2016;57(11):1387-95. 15. Rozeske RR, Valerio S, Chaudun F, Herry C. Prefrontal neuronal circuits of contextual fear conditioning. Genes Brain Behav. 2015;14(1):22-36. 16. Baldaçara L, Zugman A, Araújo C, Cogo-Moreira H, Lacerda AL, Schoedl A, et al. Reduction of anterior cingulate in adults with urban violence-related PTSD. J Affect Disord. 2014;168:13-20. 17. Mari Jde J, de Mello MF, Figueira I. The impact of urban violence on mental health. Rev Bras Psiquiatr. 2008;30(3):183-4. 18. Bressan RA, Quarantini LC, Andreoli SB, Araújo C, Breen G, Guindalini C, et al. The posttraumatic stress disorder project in Brazil: neuropsychological, structural and molecular neuroimaging studies in victims of urban violence. BMC Psychiatry. 2009;9:30. 19. Lindauer RJ, Olff M, van Meijel EP, Carlier IV, Gersons BP. Cortisol, learning, memory, and attention in relation to smaller hippocampal volume in police officers with posttraumatic stress disorder. Biol Psychiatry. 2006;59(2):171-7. 20. Lindauer RJ, Booij J, Habraken JB, Uylings HB, Olff M, Carlier IV, et al. Cerebral blood flow changes during script-driven imagery in police officers with posttraumatic stress disorder. Biol Psychiatry. 2004;56(11):853-61. 21. Schutte N, Bar O, Weiss U, Heuft G. Prediction of PTSD in police officers after six months–a prospective study. Span J Psychol. 2012;15(3):1339-48. 22. Skogstad M, Skorstad M, Lie A, Conradi HS, Heir T, Weisaeth L. Work-related post-traumatic stress disorder. Occup Med (Lond). 2013;63(3):175-82. 23. Maguen S, Metzler TJ, McCaslin SE, Inslicht SS, Henn-Haase C, Neylan TC, et al. Routine work environment stress and PTSD symptoms in police officers. J Nerv Ment Dis. 2009;197(10):754-60. 24. Baldaçara L, Jackowski AP, Schoedl A, Pupo M, Andreoli SB, Mello MF, et al. Reduced cerebellar left hemisphere and vermal volume in adults with PTSD from a community sample. J Psychiatr Res. 2011;45(12):1627-33. 25. American Psychiatric Association. Diagnostic and Statistical Manual of Mental Disorders. 4th ed. Washington, DC: American Psychiatric Association; 2000. 26. First MB, Spitzer RL, Gibbon Miriam, Williams JBW. Structured Clinical Interview for DSM-IV-TR Axis I Disorders, Research Version, Non-patient Edition. (SCID-I/NP) New York: Biometrics Research, New York State Psychiatric Institute; 2002. 27. First MB, Spitzer RL, Miriam G, Williams JBW. Structured Clinical Interview for DSM-IV-TR Axis I Disorders, Research Version, Patient Edition. (SCID-I/P): New York: Biometrics Research, New York State Psychiatric Institute; 2002. 28. Pupo MC, Jorge MR, Schoedl AF, Bressan RA, Andreoli SB, Mello MF, et al. The accuracy of the Clinician-Administered PTSD Scale (CAPS) to identify PTSD cases in victims of urban violence. Psychiatry Res. 2011;185(1-2):157-60. 29. Richter P, Werner J, Heerlein A, Kraus A, Sauer H. On the validity of the Beck Depression Inventory. A review. Psychopathology. 1998;31(3):160-8. 30. Lehrner A, Yehuda R. Biomarkers of PTSD: military applications and considerations. Eur J Psychotraumatol. 2014 Aug 14;5. 31. Woon FL, Hedges DW. Hippocampal and amygdala volumes in children and adults with childhood maltreatment-related posttraumatic stress disorder: a meta-analysis. Hippocampus. 2008;18(8):729-36. 32. Rogers MA, Yamasue H, Abe O, Yamada H, Ohtani T, Iwanami A, et al. Smaller amygdala volume and reduced anterior cingulate gray matter density associated with history of post-traumatic stress disorder. Psychiatry Res. 2009;174(3):210-6. 33. Kuo JR, Kaloupek DG, Woodward SH. Amygdala volume in combat-exposed veterans with and without posttraumatic stress disorder: a cross-sectional study. Arch Gen Psychiatry. 2012;69(10):1080-6. 34. Rauch SL, Shin LM, Segal E, Pitman RK, Carson MA, McMullin K, et al. Selectively reduced regional cortical volumes in post-traumatic stress disorder. Neuroreport. 2003;14(7):913-6. 35. Yamasue H, Kasai K, Iwanami A, Ohtani T, Yamada H, Abe O, et al. Voxel-based analysis of MRI reveals anterior cingulate gray-matter volume reduction in posttraumatic stress disorder due to terrorism. Proc Natl Acad Sci U S A. 2003;100(15):9039-43. 36. Corbo V, Salat DH, Amick MM, Leritz EC, Milberg WP, McGlinchey RE. 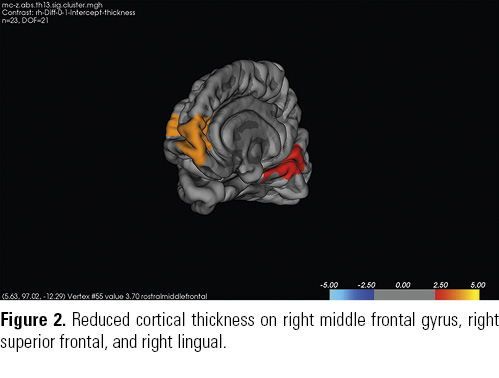 Reduced cortical thickness in veterans exposed to early life trauma. Psychiatry Res. 2014;223(2):53-60. 37. Woodward SH, Schaer M, Kaloupek DG, Cediel L, Eliez S. Smaller global and regional cortical volume in combat-related posttraumatic stress disorder. Arch Gen Psychiatry. 2009;66(12):1373-82. 38. Kuhn S, Schubert F, Gallinat J. Structural correlates of trait anxiety: reduced thickness in medial orbitofrontal cortex accompanied by volume increase in nucleus accumbens. J Affect Disord. 2011;134(1-3):315-9. 39. Gusnard DA, Raichle ME, Raichle ME. Searching for a baseline: functional imaging and the resting human brain. Nat Rev Neurosci. 2001;2(10):685-94. 40. Lanius RA, Bluhm RL, Coupland NJ, Hegadoren KM, Rowe B, Théberge J, et al. Default mode network connectivity as a predictor of post-traumatic stress disorder symptom severity in acutely traumatized subjects. Acta Psychiatr Scand. 121(1):33-40. 41. Kim SJ, Jeong DU, Sim ME, Bae SC, Chung A, Kim MJ, et al. Asymmetrically altered integrity of cingulum bundle in posttraumatic stress disorder. Neuropsychobiology. 2006;54(2):120-5.